Endeavor and its Astronaut crews were stars alright. 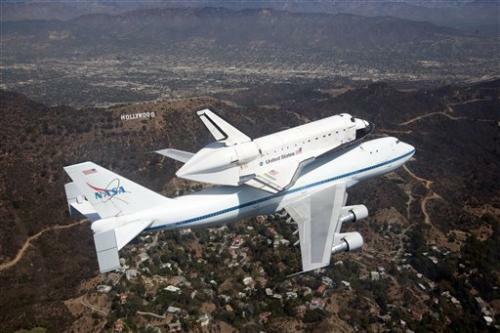 A NASA photo distributed by the Associated Press shows the space shuttle, atop a NASA 747 jumbo jet, flying over the Hollywood sign as it approached Los Angeles International Airport on Friday. There, Endeavor will be prepared for a 12-mile road trip to the California Science Center, where it will go on permanent display. Friday’s flight from Edwards Air Force Base in the Mojave desert came after Endeavor tallied 123 million miles in 25 trips into low-Earth orbit. We all can recall some of those launches in straight-up blasts atop a carrier rockets. The last one was on May 16, 2011 with Endeavor under the command of Mark Kelly, the husband of Rep. Gabrielle Giffords. Endeavor replaced the Challenger shuttle which exploded during liftoff in 1986. 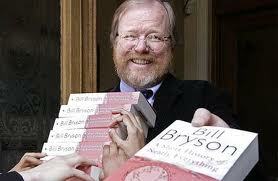 We’ve always been pleased to have Bill Bryson’s 2003 book, A Short History of Nearly Everything, in our library, and now we intend to set about reading it cover-to-cover. That resolve comes after revisiting Bryson’s engaging treatment of “The Reverend Evans’s Universe” near the book’s start. You won’t find a more engaging introduction to the truly awesome death of supernovae far out, very fortunately, in the universe. Nor will you find many other places (including, however, the works of John McPhee) that offer such helpful clues to engaging technical writing. That’s right, technical writing can be at least somewhat engaging, without ceasing to be accurate, informative and helpful.